When many of us think of tea, we will think in terms of either black tea or green tea. However, there are actually many ‘shades’ of tea that don’t fall so neatly into either of these camps and one of these is ‘Oolong tea’. Oolong tea finds itself somewhere between green and black tea as it is only partially fermented. Don’t pigeon hole tea! Oolong tea is one of the most popular traditional teas from China and Taiwan and has been enjoyed for its health benefits in those regions for a long time. The oolong leaf contains catechin and caffeine together which both fight free radicals and thereby help to prevent cancer and cellular degeneration. Oolong tea is also rich in polyphenols, the effects of which are heightened by the semi oxidization process. The tea has a very mild taste which is hard to object to and if you find it a little too bland then adding the tiniest bit of honey can improve the flavor. One of the biggest health claims surrounding Oolong tea that attracts the biggest number of new fans, is the claim that it can aid with weight loss. Studies suggest that drinking Oolong tea encourages the body to burn more fat and in one study carried out by researchers at the Human Performance Laboratory, participants were observed to burn an extra 67 calories daily simply by drinking the tea. That’s not a huge amount maybe but it’s approximately the amount of a single stick of a KitKat – which actually adds up over time! In another study, it was found that energy expenditure was increased by around 10% after Oolong tea consumption, which is in contrast to the significantly lower 4% benefit offered by other green tea. This is despite the lower levels of caffeine. So what’s the miracle ingredient that leads to this enhanced fat metabolism? It appears to be an increased number of polymerized polyphenols (1). The wealth of evidence suggests that this is a fat burner that actually works – even if the results aren’t all that profound. These polyphenols may also help to prevent fat building, which provides an additional advantage in the fight against weight gain. The semi oxidization process is also responsible for increasing the enzyme lipase via the ideally formed polyphenol molecules. This helps to dissolve body fat and is additionally beneficial for improving cholesterol. Oolong alkalizes the digestive tract and thereby helps to reduce inflammation. This is excellent for reducing acid reflux and can be helpful for combating stomach ulcers. It’s also a mild antiseptic which makes it good for a range of stomach complaints and throat issues. 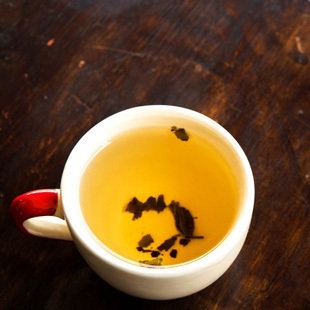 Some people will drink a warm cup of oolong as a comforting beverage when they’re feeling ill.
Oolong tea contains very small quantities of calcium and magnesium, which have a synergistic effect at improving bone strength as well as supporting the strength of connective tissues. These amounts may be very small but it makes for a more nutritious drink.